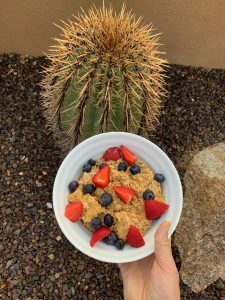 Pumpkin Pie Overnight Oats | Ridge's Stitches | Health Coach. Yoga. Clothing. I just led a retreat in Scottsdale, Arizona. It was the most magnificent time and truly gave me the opportunity to cook for the fall. We had a packed schedule with hiking, yoga, and face masks so our meals had to be quick but delicious. I wanted these women to feel like they could make these recipes at home with ease. You can even make this as a pumpkin pie chia pudding. Top with some berries to add a pop of color and a burst of sweetness in your mouth. In a medium bowl, stir together milk, oats, chia, maple syrup or honey, pumpkin puree, vanilla, cinnamon, and nutmeg. Divide mixture into 2 8 oz. Mason jars. The oats should be covered with liquid so add more if need be. Add fresh fruit, nuts, hemp seeds, or any other toppings of your choice.